Ildefonso Guajardo, Mexico's Secretary of Economy; Chrystia Freeland, Canada's Minister of Foreign Affairs; and Robert Lighthizer, United States Trade Representative, make statements to the media, in Montreal, Quebec, Canada, Jan. 29, 2018. U.S. President Donald Trump's trade chief on Monday dismissed Canadian proposals for unblocking NAFTA modernization talks but pledged to stay at the table, easing concerns about a potentially imminent U.S. withdrawal from the trilateral pact. Trump, who described the 1994 pact as a disaster that has drained manufacturing jobs to Mexico, has frequently threatened abandon it unless it can be renegotiated to bring back jobs to the United States. U.S. Trade Representative Robert Lighthizer said after a sixth round of NAFTA modernization talks in Montreal that Trump's views on the pact are unchanged, and cautioned that talks are still moving too slowly on U.S. priorities. "We finally began to discuss the core issues, so this round was a step forward," Lighthizer said. "But we are progressing very slowly. We owe it to our citizens, who are operating in a state of uncertainty, to move much faster." FILE - U.S. Trade Representative Robert Lighthizer speaks during a news conference at the start of NAFTA renegotiations in Washington, Aug. 16, 2017. But Lighthizer's Mexican and Canadian counterparts said that enough progress was made in Montreal to be optimistic about concluding the pact "soon," with nine days of talks in Mexico City scheduled to start Feb. 26. "For the next round, we will still have substantial challenges to overcome. Yet the progress made so far puts us on the right track to create landing zones to conclude the negotiation soon," said Mexico's Economy Minister Ildefonso Guajardo. Officials are now openly speculating that the bid to salvage the $1.2-trillion free trade pact will continue well beyond an end-March deadline set to avoid Mexican presidential elections. Heading into Montreal last week, some officials had feared the United States might be prepared to pull the plug on the pact amid frustration over slow progress. The mood lightened after Canada presented a series of suggested compromises to address U.S. demands for reform. 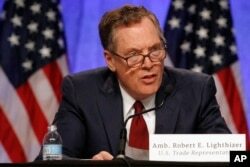 But Lighthizer criticized Canadian proposals to meet U.S. demands for higher North American content in autos, saying it would in fact reduce regional autos jobs and allow more Chinese-made parts into vehicles made in the region. He also dismissed a suggestion on settling disputes between investors and member states as "unacceptable" and "a poison pill" and said a recent Canadian challenge against U.S. trade practices at the World Trade Organization "constitutes a massive attack on all of our trade laws." Canadian Foreign Minister Chrystia Freeland, who stood stony faced as Lighthizer made his remarks, later told reporters that "the negotiating process is ... always dramatic." Chrystia Freeland, Canada's Minister of Foreign Affairs, speaks to the media following NAFTA renegotiations in Montreal, Quebec, Canada, Jan. 29, 2018. A Canadian government source, speaking on the condition of anonymity, noted Lighthizer had not speculated about withdrawal and said the U.S. official had been more positive in private than during previous rounds. Officials said the negotiating teams had closed a chapter on anti-corruption measures and were close to wrapping up sections on telecommunications, sanitary measures for the agriculture industry and technical barriers to trade. But the three sides are still far apart over U.S. demands to boost regional auto content requirements to 85 percent from the current 62.5 percent and require 50 percent U.S. content in North American-built vehicles. Other challenges are Washington's demands that NAFTA largely eliminate trade and investment dispute-settlement systems and contain a "sunset" clause to force renegotiations every five years. Critical comments by Trump, Lighthizer and others have unsettled markets that fret about the potential damage to a highly integrated North American economy if the United States gives six months' notice it is leaving. The Mexican round next month is an extra set of talks that officials added to help tackle the many remaining challenges. Negotiators are supposed to finish in Washington in March with the eighth and final round. Although some officials have privately speculated about freezing the talks at the start of April, Guajardo told reporters that "we cannot afford to suspend this process."